MCN published some quotes from Casey Stoner earlier today, including some very interesting ones. You can read the full story here, but the upshot is you shouldn’t be surprised to see Casey Stoner racing next year at a few circuits. While the rule changes alone promise an interesting MotoGP series this year, Stoner’s occasional racing would be great so see. Why not? Stoner and the Duke crew have nothing to lose. It’s a smart move by Ducati. Their engine development is frozen this season so some real testing in the form of a few races can only help with programming the Marelli software. But Casey has admitted to using as little TC as possible in years past. Doesn’t save tires but it does save fuel. Like others, I want to see how he can cause some frustrations for the usual suspects. Him going to COTA would be awesome. He is a sensitive boy. But a fast sensitive boy. If anything it’ll make the Andreas try even harder. That would add some interest to the season after the debacle of the previous season. Iannone was quick last year, I’d bet Stoner will be too. Having Stoner in a few races will only make the season better. 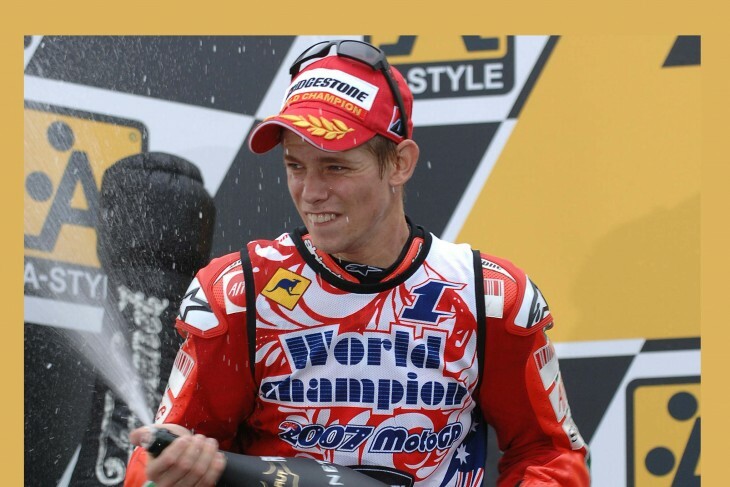 I’m s big fan of seeing Stoner in a few wildcards and it would be awesome if one of those could be COTA. They could use the attendance numbers and revenue and I wouldn’t mind seeing him race on American soil again. Wonder what the rest of the paddock thinks about Stoner sitting in on a few races? Fear and trembling all around, or just from the Andreas who wouldn’t take too kindly to being shown up? I wonder if Ducati were privy to the lap times Stoner was posting as a Honda test pilot? With so many years away from the sport one has to wonder what his numbers are. That’s gotta be the question everyone wants to know! “The reason I wanted to replace Dani Pedrosa at Austin was because I knew that I had the speed to do it. At the Sepang test in February I was doing times very close to Dani’s race pace.” — So says Casey Stoner in the article Dirck links to above. There isn’t any reason to believe he is exaggerating. He may not have lined up in any MotoGP races, but he hasn’t been completely out of the game these past years. I hope to see him at COTA too! How soon until Stoner starts crying about the Press, his sore tummy, etc etc. He’ll be fine for wildcards, not as much pressure. Maybe he’ll find his nerve again. In other words, unlike Honda, Ducati only has Andrea Iannone and Andrea Dovisioso, not Mark Marquez. Yeah, those guys are untalented slobs. Whatever, dude. They didn’t have Dani for a few rounds and instead of using Stoner they gave the ride to someone that ran back with the open class bikes when he wasn’t crashing. Not letting Stoner replace Dani was a very poor decision. Me too Jeremy. iF Stoner can get in some laps on the new bike, he may make a few races interesting. As a matter of fact could be a deciding factor in the championship if it’s a close race. I’m really looking forward to this season. If I see Stoner in the mix on a few circuits, all the better. +1. Regardless of what you think about his personality, it realy could make for some awsome racing. It will interesting to see how well he adapts to the Ducati and one would have to think that with the new tyres and electronics, the field will be closer than ever. BRING IT ON!! !